The spyder bodies Frua designed for the Maserati A6G chassis rank among his loveliest creations. Depending upon the angle from which they are viewed, they appear either crisply tailored or boldly muscular, with subtle creases through the flanks setting off slightly kicked up rear fenders and rounded body sides that seem to flow down and tuck under the chassis. Small bumperettes in the front and rear give the impression of sporty lightness, opening up the deeply scooped grille and cupping the famed Maserati trident. 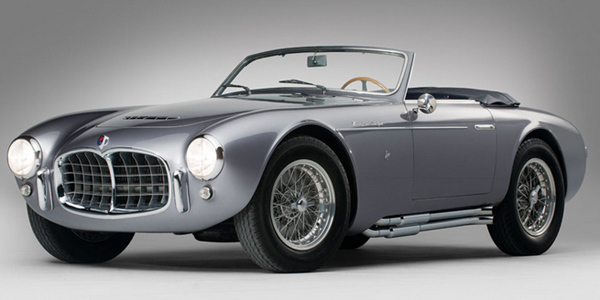 In many ways, the design resembles the famed AC Ace and Shelby Cobra, which it happened to predate it. One has to wonder who inspired whom.